Check your new sod thoroughly to make sure it has the right moisture, thickness and proper color. Keep in mind that healthy sod exhibits dense foliage with a uniform green hue. You should note that healthy sod has moist soil near the roots and the roots should appear thick and intertwined close together. The roots being intertwined are indicative that the sod has the strength to survive the shipping and the stress that it undergoes from harvesting to planting and won’t tear apart or weaken during the transition. Make sure your new sod is “farm fresh” and installed quickly, properly and professionally. The soil that comes with your sod should be no more than one inch deep. If you have more than one inch of soil, you’ll have too much between the roots and the soil where it’s going to be planted. If you have less than one inch of soil with the sod you’ll have too little soil to support the grass until it gets established and the roots grow into the soil where it has been planted. 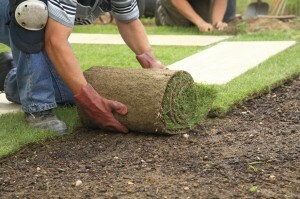 You want to make sure that the sod you are buying has been recently harvested. Inspect the sod to see if there is any thatch that is visible. If you see a layer of thatch, the sod is suspect and is a warning sign that it may be old sod that has been lying around too long. If the sod is old, the roots may grow slowly when replanted. For best results, look for sod that has been delivered in the past day. Also, it is extremely important to plant your new sod quickly. There should be no more than an eight hour delay between when the sod was harvested until the time it is planted. The shorter the time span between harvest and planting, the less stress will be placed on your sod. Sod that has been stressed is more susceptible to invasive pests and diseases. Finally, make sure that the sod you are buying has been properly fertilized. Properly fertilized sod is more drought resistant, less susceptible to disease, bright green in color, and more resistant to stress related problems. You should also find out when the last time the sod was fertilized. Over-fertilizing your lawn can be almost as problematic for your sod as under fertilizing it. Both extremes can lead to crabgrass, wilting, or the disease known as Brown Patch. To ensure a healthy lawn, buy farm fresh sod from Harmony Turf sod growers. You can find Harmony Turfgrass at most home improvement retailers nationwide or by using this easy store locator. And keep your new lawn healthy with Harmony Care service – personal lawn care by professional growers.